"We want our museum to be relevant." I've heard (and said) this many times. But what does it mean for a cultural institution to be relevant? To whom? How? Why? Relevance is relative and relational. It's the extent to which a thing is connected to something that matters. In pop culture contexts, relevance is about currency. Now-ness. Relevant information is ripped from the headlines, hot hot hot. Exhibition about #blacklivesmatter? That's relevant. In professional contexts, relevance is about utility. Usefulness. Relevant information helps solve a problem or improve a line of work. Art therapy program for trauma victims? That's relevant. In personal contexts, relevance is about meaning. Interest. Relevant information feeds a person's (or a group's) proclivity or affinity. Lecture on bees for an audience of beekeepers? That's relevant. How do we build relevance in cultural institutions? We become more relevant when we matter more to more people. We do that by being useful and meaningful. Not by being hip. Ignore flash. The fastest path to irrelevance is trying to keep up with the cool kids. 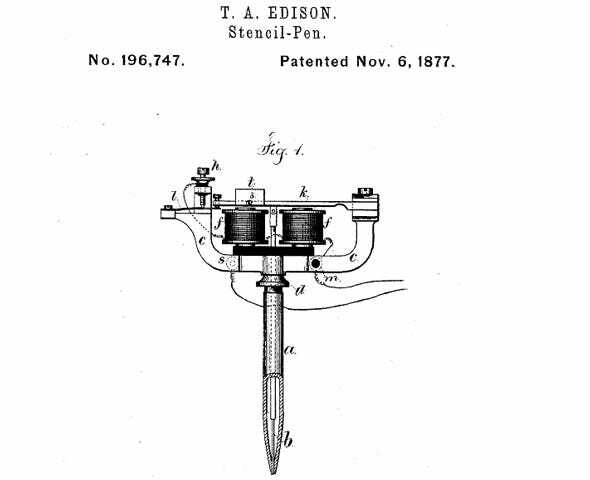 We are wasting resources on of-the-moment content and hot new gadgets. Interrogate form. Relevance isn't solely about content. We need to think about the structure of how our institutions function--from hours of operation to explicit and implicit rules of use--to make our work relevant to the patterns of contemporary life. Identify the "who." The implication of "being more relevant" is being more relevant to somebody. Who is that somebody? The more we know about the community or communities of interest, the better we can connect to their interests, needs, and assets. If we want to matter more, we need to know what matters. Make change. Relevance isn't something you wish for. It's something you build. Once we understand what matters most to people, we have to make changes to make those new connections. Credibly. Sincerely. Seriously. Acknowledge that relevance is a door, not a destination. Relevance doesn't incite powerful emotions or learning on its own. It is a gateway that opens the potential for more. When we connect our work to the things that matter most to people, in forms that fit their patterns of life, it will be relevant. And then the real work (and magic!) can begin. Over the next few weeks, I'm diving deeper into these topics with a series of posts. If you are curious about what relevance means in the cultural sector, this series will probably be relevant to you. If you'd like to weigh in, please leave a comment or send me an email with your thoughts. At the end of the series, I'll re-edit the whole thread into a long format essay. I look forward to your examples, amplifications, and disagreements shaping the story ahead. Here's my first question for you: what's the biggest question on your mind about relevance and cultural institutions? Today is my birthday. I decided to give myself a gift this year: permission to change the Museum 2.0 blog. I've been blogging weekly for almost nine years. Now, I'm planning to shift to a less regular schedule, prioritizing quality over quantity and consistency. No more Wednesdays like clockwork. Instead: intermittent, thoughtful posts with passion behind them. I don't make this change lightly. I love the rigor of weekly blog posts because it forces me to keep up an important activity that helps me learn and grow. I believe in the power of ritual. I'm nervous to let go of a ritual that has been so meaningful to me (and hopefully, to you) for so long. But I also know there is huge potential to improve Museum 2.0. My decision crystallized last week, when I read Diane Ragsdale's thought-provoking post about the Irvine Foundation's recent report on the cultural lives of Californians. And then this morning, when I read Ian David Moss's reflections on the same report. I've been planning to blog about the Irvine report as well. But I realized, reading their fine posts, that my current blog format doesn't enable me to go into the depth and analysis I want to. To add something substantive to the conversation. To advance my learning (and hopefully yours) on issues that matter. I used to want to be the dependable weekly source. Now, I want to be more like Diane Ragsdale (who doesn't?). Diane doesn't blog every week. She blogs when it makes sense, when she has something meaty and glorious and challenging to share. And then she takes the time to really engage with commenters in substantive discussion. I have no illusions that I can be Diane Ragsdale. But I can be someone who dives into big questions, explores research, profiles powerful projects, shares surprising lessons, and proposes wild ideas. With joy. Deeply. Frequently. Sometimes. When the time is right. This year, I want to give myself space to write when it feels best. I want to believe in my ability to keep blogging without consistent deadlines. I'm scared to hit "publish" on this post, but I know it's the right thing to do. I hope this gift will open new doors to learn, share, and connect. And send me into this next trip around the sun eager for the challenges ahead. Thanks for being part of the continued journey of Museum 2.0. Last week on this blog, I tried an experiment. I wanted to open up conversation about how we judge the relative ethics of various sources of museum revenue--all of which have moral grey areas. Instead of writing a post and soliciting comments (my typical approach), I used an online polling tool to create a simple game where you could read short provocations about questionable revenue sources and give each source an ethical thumbs-up or down. The outcome taught me a few things about ethics... but it taught me even more about online interaction. 10,000ish people saw the blog post on the web or as an email. 3,125 people viewed the game. 610 people played the game. 20 people commented on it. This is a beautiful demonstration of participation inequality online. The vast majority of folks consume most content online passively. Some people actively play, share, collect, or gather online content. A small percentage comment on it. An even smaller percentage create it. When people talk about participation inequality, we often focus on the disparity among levels of participation. We ask: how can we motivate more people to contribute? But another way to look at participation inequality is via the diversity of types of participation available. We ask: how can we create different pathways to participation for people with different motivations? On platforms with many participatory options, more people are more active. On Facebook, you can post, like, comment, add photos, play games... but you don't have to do all of those things to be an active contributor. Watching friends change their profile shots to celebrate the Supreme Court ruling on gay marriage reminded me how Facebook is constantly experimenting with new ways to participate. I think this diversification is key to inviting broad audiences to feel meaningfully involved in participatory projects. So often we stick with one or two basic strategies, ignoring the fact that those forms may be welcoming to some and off-putting to others. I'm as guilty of this as anyone. I write blog posts on a platform where you can comment. I assume that commenting is the way people want to participate. But the barriers to commenting--both technical and psychological--can be huge. When I decided to make this little game about museum ethics, I hoped that more people would participate than typically comment on a blog post. I was astounded by the difference. 0.6% of game viewers commented. 20% of game viewers played. Clearly it was an effective alternative form of participation. I learned from what these 610 players contributed. It challenged some of my preconceptions about how people feel about the ethics of grants, attendance, facility rental, and corporate sponsorship. It gave me (and hopefully them) a whole lot more food for thought than the post alone. Games aren't right for every circumstance. But this experiment made me question: what am I doing to make it easy and meaningful for people to participate in the work we do? How can we offer more diverse ways for people to get involved? Share your comment below. If you are reading this via email, you can join the 0 Comments here. A few weeks ago, debates in England got me thinking about the relative ethics of sources of museum revenue. The London Science Museum and the Tate were both under fire for taking sponsorship money from BP (which, at least at the Science Museum, came with some content strings attached). At the same time, Michael Savage wrote a blog post called The stupid fetish of free admission, and the end of the British Museum. In it, he argues that the British Museum's value has been severely compromised by its willingness to lend its artifacts out to other institutions worldwide for a fee. He also wrote a post slamming the Met and other museums for galas that smack of elitism. 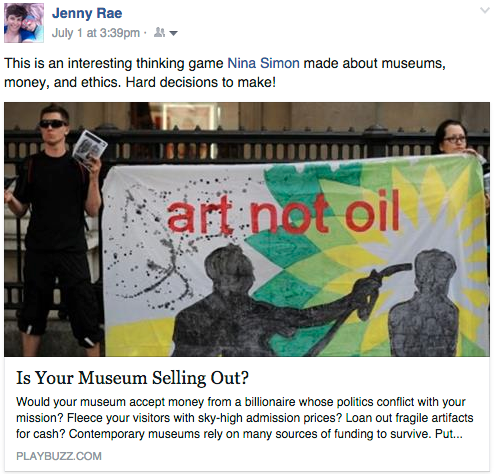 I was intrigued by the different ethical questions related to museum income. And so, I present here a simple, irreverent game in which you can play museum director and rank the relative ethics of various sources of museum revenue. If you can't see it below, click here to play. Most museums earn money with most of these sources--and some may not feel like ethical concerns to you at all. There are wonderful aspects to each of these types of revenue sources. But there are ethical issues too, and it's worth talking about their relative impact. Share the game with your colleagues... and add your additional thoughts in the comments under the respective revenue sources. Play on.